MPU-1 is dedicated to measure leakage current when working on Overhead Lines in AC, low and medium voltage power networks. 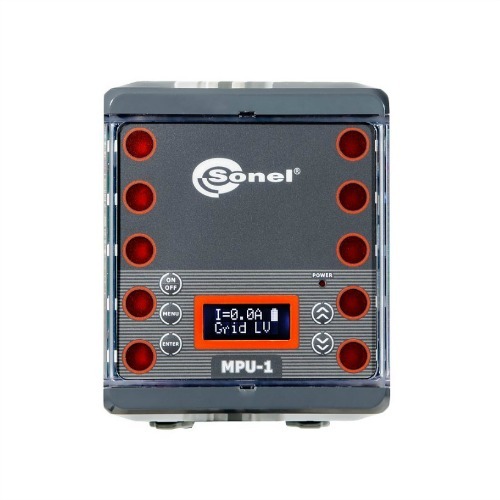 It is designed to make measurements, with results defining network’s safety condition for leakage current. The device enables a set limit for maximum safe value of flowing leakage current and for values above this limit visual and sound alarm is activated. Constant controlling of current flowing on earthing. Measurement with the use of single clamp or two clamps simultaneously. In case of using two clamps, current value is summed up, which allows for checking twin pylons (rotational), with independent clamp for each component pylon. Visual and sound alarm (speaker built in cover) in case of higher value of leakage current than defined limit (factory default set to 1A). Measurement with flexible clamps (Rogowski coil) Sonel F series. Measurement in 50 Hz or 60 Hz frequency low and medium voltage networks. MPU-1 for operation requires F1, F-2 or F-3 clamp (additional accessories). Article – Taking Care of Work Safety on Low and Medium Voltage Power Networks.